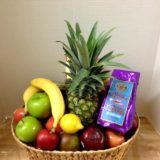 Fresh Fruit gift basket, hand picked by Tina, topped with a Bee Well Bee! 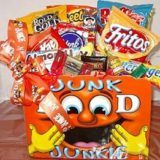 Say Bee Well with this great gift basket! 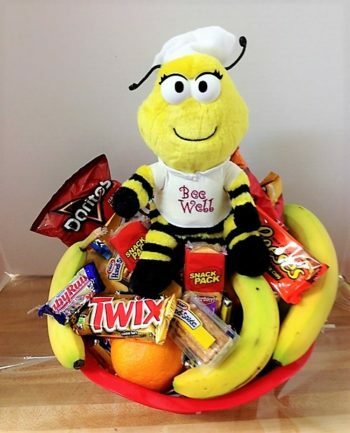 When we top a fresh fruit basket with this Bee Well Bee, you know you’re sending the freshest seasonal fruit available, from apples, bananas, oranges, kiwi, pears and more, an assortment of cookies and a great, happy Bee Well Bear! 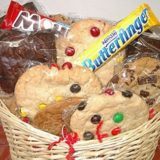 Every time we deliver this basket we get smiles, in elevators, in reception offices, even at doctor’s offices! 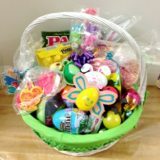 This is the perfect fresh fruit basket for a loved one in the hospital, and the goodies are often shared with care givers (who are always very grateful for the fresh fruit and cookies!) Sure to please! 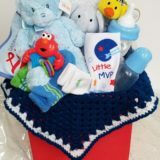 You might prefer our Bee Well Gift Basket or our Bee Well Bee.